Mitchell Krueger figured the odds were with him this time. In his first round matches at Wimbledon the past two years, Krueger had lost an advantage set that kept him from advancing, one of them by a eye-popping 16-14 score. Saturday, on a breezy and cool afternoon at the All England Club, the eighth-seeded Texan turned that trend to his favor, beating the dangerous Kyle Edmund of Great Britain 4-6, 7-6(6), 10-8. "I was hoping I could have a seemingly guaranteed first round win finally, and then I see that draw, and oh my god," said Krueger. "He's one of the one or two guys you don't want to play in the first round--he's definitely one of the top eight seeds (in ability). He won a round in qualies here, so he's definitely playing well. I knew it was going to be tough and I had to dig it out." Both players had difficulty adjusting to the gusty wins as the first three games went to the returner, with Edmund ending that string when he held for 3-1. After that, both boys held serve, with neither facing a break point and Edmund finishing off the set. There were no breaks in the second set, as both players adjusted to the conditions, which included people standing four deep around tiny court 9, with the only seating six or seven wooden benches on each side of the court. Krueger had struggled returning Edmund's second serve, often doing more with his first serve return, but he began to find the range late in the second set. Krueger also began to close the net with more frequency, hitting several dazzling volleys that elicited the very British "well-played" comment from the spectators, even though they squarely backing Edmund. At 4-4 in the second set, Krueger saved a break point when Edmund missed a backhand, and the second set would be decided in a tiebreaker. Edmund got out to a 4-2 lead at the change of ends, but couldn't cling to that advantage. With Krueger leading 5-4, Edmund had a forehand lined up and Krueger slipped and fell, giving him no chance to return it, but Edmund sent it a few inches long, and Krueger had two set points. Edmund saved the first with a good first serve, and Krueger missed a backhand badly to make it 6-6, but there was no anger or frustration visible. Krueger got his third set point when Edmund netted a backhand, and this time he converted with a strong and deep return of a good first serve that caused Edmund to send a backhand wide. Every game in the third set also went to the server until the 17th game. Points and games were much longer than they had been in the second set, and the wind continued to cause problems. Both players caught their tosses numerous times while serving, when a particularly vicious wind gust would make a normal toss impossible. Serving from behind throughout the final set, Krueger faced a tough moment at 6-7, 15-30. Several good shots brought Edmund to an advantage position at the net, but Krueger hit a perfect lob despite the tricky wins. Instead of facing two match points, it was 30-all. Never particularly demonstrative on the court, Krueger did let out a "c'mon" after that point, then won the next two to make it 7-7. "That was a good shot," Krueger admitted, after saying he was lucky to win some of the big points in the match's later stages. "He made a couple of errors when I needed them." The lowlight of the 15th game was an overhead smash that Edmund hit on ad-in after four previous deuces. Hit so hard that it was difficult to track, neither the baseline umpire nor the chair saw it out, although it was more than a foot behind the baseline. Krueger protested briefly to the chair umpire, but he did not let it bother him. "I wasn't even mad, I was just kind of shocked that no one called it," Krueger said. "I think the chair umpire knew she missed it--I was asking her if she saw it in or out and she said she thought she saw it in, but then told me I might have been right, which was not really what I wanted to hear. I actually thought it was pretty funny, given the situation." Putting that gaffe aside, Krueger held for 8-all, and it was Edmund who saw his level drop. Two good returns by Krueger and two backhand errors by Edmund and Krueger had his break, but the drama wasn't quite over. Serving at 9-8, Krueger got to 30-15, but a good volley by Edmund and a netted backhand gave Edmund a break point and a chance to continue the match. Edmund couldn't convert, netting a backhand, and on the next point he shanked a forehand return of a good second serve high into the air, giving Krueger a match point. A forehand volley winner sealed it for the 18-year-old, who had lost to Edmund at the 2011 US Open Juniors and in the final of a junior exhibition tournament in Zurich this spring. "I love grass," said Krueger, a semifinalist at Roland Garros earlier this month. "It suits my game better than clay, and I was playing well in Paris, so I'm glad to get this one out of the way." The 17-year-old Edmund, who had reached at least the quarterfinals of the past three junior slams, wasn't happy with his performance. "I thought I could have made a few more shots at the key moments, but they didn't come off today," said Edmund. "I knew it wasn't going to be pretty tennis out there, not many winners, just gutsing it out in the long rallies and key points, which I didn't do as well today as I have done in the past. He played well and when he came to the net, I struggled to pass him today. In the end, it was just one break." Edmund talked of his desire to play well at his home slam, where he lost in the second round last year. 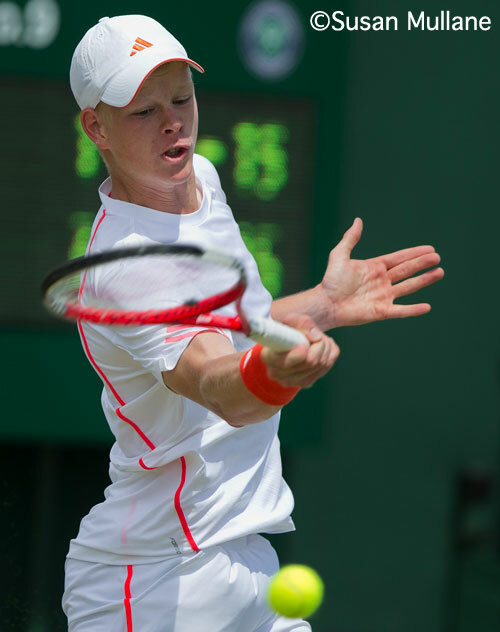 "You want to win, because you're British, playing in Britain," said Edmund, who was watched today by both Greg Rusedski and Paul Annacone, as well as many others with an interest in British player development. "It's frustrating--you want to give something back. But to play at Wimbledon and get a chance to do that, it's really nice." The Krueger - Edmund match may have gone the distance, but it wasn't the longest junior match of the day. That distinction went to Mathias Bourgue's 6-7(4), 6-4, 14-12 win over Alexios Halebian, in which the Frenchman saved four match points. As the sun began to drop behind Court 3, leaving Court 7 in shadows and any spectators in their summer clothes shivering in the chilly breeze, Bourgue was serving at 6-7 in the third set when the first match points surfaced. A wide forehand from the 18-year-old from Avignon gave Halebian his first chance to end the match, but Bourgue saved it with a forehand winner. The second match point was saved with a good first serve that Halebian blocked back into the net, and the next two points went to Bourgue by virtue of a forehand winner and a lob smack on the baseline. Halebian dug himself out of a 0-40 hole at 11-11, with his serve coming to his rescue there, and seemed to have the momentum when Bourgue fell behind 15-40 serving at 11-12. Bourgue's knee, bleeding from a dive in the previous game, didn't hamper him on his serve, and a good first serve saw another Halebian return find the net. At 30-40, Halebian sliced a forehand into the net, and that was the last match point he would have. Broken on a double fault to give Bourgue a 13-12 lead, Halebian saved one match point with a fine backhand pass. Bourgue saved two break points to get back to match point again, and with a forehand volley winner he converted it, raising his hands in a gesture that seemed as much with relief as joy. Court 7 was not a good court for Americans on Saturday, with Halebian, Connor Farren and Mackenzie McDonald, the No. 15 seed, all losing there. Farren, who had only started hitting a few weeks ago after a wrist injury kept him from competition since the Australian Junior championships, lost to No. 10 seed Mateo Martinzez of Argentina 6-2, 6-2. McDonald fell to Pietro Licciardi 4-6, 6-2, 6-4, and Spencer Papa, who was originally scheduled to play on court 7 but was moved due to the length of the Bourgue - Halebian match, lost to Pedja Krstin of Serbia 7-5, 6-2. Sachia Vickery, the No. 7 seed, was the only other American in action on Saturday, and she beat Ilka Csoregi of Romania 6-3, 6-2. The only girls seed to lose was No. 9 seed Daria Gavrilova of Russia, who was beaten by Marcela Zacarias of Mexico 7-5, 4-6, 8-6. Zacarias, who won the Grade 2 on the grass in Halle two weeks ago, was a dangerous floater, but Gavrilova had posted a win over Yanina Wickmayer in a WTA event recently and had been expected to improve on her showing last year, when she lost in the first round to Kateryna Kozlova of Ukraine as the No. 1 seed. The remaining 32 first round singles matches are scheduled for Monday, with doubles also starting then. Sunday is an off day for everyone. For the draws and schedule, see the Wimbledon website. It's been a long day, with a transatlantic flight to Heathrow, a trip on the tube to the hotel and a journey by bus to the All England Club, but I'm ready for the start of play tomorrow of the Wimbledon Junior Championships--once I get some rest, that is. In the final round of qualifying today, Catherine Harrison, Stefan Kozlov and Thai Kwiatkowski won their matches to make the main draw. Harrison also qualified last year, while Kozlov and Kwiatkowski are making their Wimbledon debuts. Also in the main draw is Christina Makarova, who didn't make my Wimbledon preview due to her absence from the French Junior Championships and this week's Grade 1 in Roehampton. The other American girls in the draw are top seed Taylor Townsend, Chalena Scholl, Allie Kiick, Jennifer Brady, Kyle McPhillips and Sachia Vickery. The other American boys in the draw are Mitchell Krueger, Noah Rubin, Mackenzie McDonald, Alexios Halebian, Spencer Papa and Connor Farren. Only half of the 64 first round singles matches will be played on Saturday, but five of the US boys are in action, four of them on Court 7: Farren, Halebian, Papa, McDonald and Krueger. Krueger will be involved in the marquee match of the day, with the No. 8 seed playing unseeded Kyle Edmund of Great Britain. As I wrote in my junior preview yesterday, Edmund won a round in men's qualifying last week, and the 2011 US Open boys semifinalist is solid and comfortable on grass. It's not a good draw for either player, to put it mildly. Krueger lost to Edmund in three sets in the second round of the US Open Juniors last year, a match played indoors at the Sound Shore Club. Sachia Vickery, seeded No. 7, is the only US girl in action Saturday; she plays Ilka Csoregi of Romania, last on Court 16. It's interesting to note, as I pointed out on Twitter earlier today, that three non-British girls received wild cards into the main draw: Jelena Ostapenko of Latvia, Antonia Lottner of Germany and Kathinka Von Deichmann of Luxembourg. Enzo Couacaud of France is the only wild card in the boys draw who is not from Great Britain. The complete draws and the order of play for Saturday are available at the tournament website. Today at Roehampton, Eugenie Bouchard of Canada swept the singles and doubles titles at the Grade 1. The second-seeded Bouchard beat unseeded Carol Zhao in an all-Canadian final 6-1, 1-6, 6-3 in singles, then teamed with Townsend to take the doubles title over unseeded Jennifer Brady and Kyle McPhillips 6-3, 3-6, 10-5. In the boys draw, French Open boys champion Kimmer Coppejans of Belgium defeated unseeded Laurent Lokoli of France 6-2, 7-6(5), his 12th straight ITF junior victory. The boys doubles championship went to No. 4 seeds Luke Saville and Jordan Thompson of Australia, who beat unseeded Evgeny Karlovskiy of Russia and Frederico Silva of Portgugal 6-1, 4-6, 10-6. The upcoming junior doubles at Wimbledon are not played with no-ad and match tiebreaker scoring, and when teams are tied at 6-6 in the third set, the winner must have a two-game advantage. 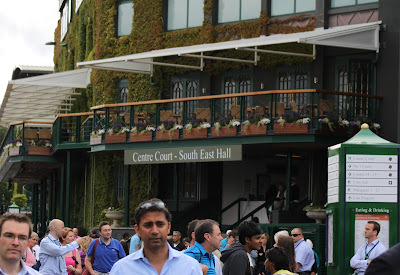 I'm getting ready to head to Wimbledon to cover the Junior Championships, so this early post will provide my preview of the event for Tennis Recruiting Network. I haven't been to Wimbledon since 2007, when Donald Young won the boys title and Madison Brengle lost to Urszula Radwanska in the final. Despite a dismal stretch of wet weather at the start, which led to short scoring and very late evenings, it was a good year to cover American juniors. I hope the weather is better and the US performances just as good. In other news, Katerina Stewart, who will turn 15 next month, has signed with Norton Sports Management. Stewart, the winner of the 14s Junior Orange Bowl in December and the 18s Florida Closed this month, lives and trains in South Florida. For junior or college players looking for matches in the coming month, check out the ITA Summer Circuit. As tournaments go, they are inexpensive, and the opportunity to get four or five competitive matches in a short period of time on a college campus is a great combination. For more on the many events scheduled for this month, see the ITA website. Sloane Stephens reached the third round at Wimbledon with a tough three-set victory today over No. 23 seed Petra Cetkovska of the Czech Republic. Although ESPN didn't show much of the match, it was by all accounts close and hard-fought, yet it was the younger and less experienced Stephens who came through 7-6(6), 4-6, 6-3. Stephens, 19, made the fourth round at the French Open and has continued her excellent play on grass. Greg Garber of ESPN has an interesting slam comparison between Serena Williams and Stephens in his article about her, and you can also read why she's not a fan of ATP pro Gilles Simon. Ryan Harrison lost to top seed and defending champion Novak Djokovic 6-4, 6-4, 6-4 in the day's last match, played under the roof of Centre Court. Many of the US boys scheduled to compete in the Wimbledon junior championships were in Harrison's player box--I saw Mitchell Krueger, Mackenzie McDonald, Alexios Halebian, Noah Rubin and Spencer Papa--as was TCU men's head coach David Roditi. It was a great opportunity for the boys to see the world's No. 1 play on the world's most famous court. Due to persistent drizzle in the afternoon, many matches were not completed, and Christina McHale's second round match with Mathilde Johansson of France was postponed until Thursday. For the complete schedule, see the Wimbledon website. The Wimbledon junior qualifying draws are out, with Catherine Harrison and Blair Shankle in the girls draw and Stefan Kozlov, Thai Kwiatkowski and Austin Siegel in the boys draw. Top seed Taylor Townsend lost in the quarterfinals today at the Grade 1 in Roehampton, as did Allie Kiick and Sachia Vickery. Townsend fell to the tenth seed, 15-year-old Francoise Abanda of Canada, 0-6, 7-5, 6-2. The eighth-seeded Kiick was beaten by Eugenie Bouchard, the No. 2 seed, 7-5, 6-2, and Vickery, the No. 4 seed, lost to No. 12 seed Belinda Bencic of Switzerland 6-3, 6-4. Bencic had also beaten Vickery in the final of an exhibition tournament in Liverpool last week. Unseeded Carol Zhao gave Canada its third girls semifinalist, beating unseeded Camilla Rosatello of Italy, and she will play Abanda in Thursday's semifinals. Townsend, playing with Bouchard, and the unseeded team of Jennifer Brady and Kyle McPhillips are in the girls doubles semifinals. The boys draw also lost its No. 1 seed, Luke Saville, who was beaten in Tuesday's third round by unseeded Laurent Lokoli of France. Lokoli won again today to reach the semifinals, where he'll play No. 16 seed Nick Kyrgios of Australia. No. 5 seed Liam Broady of Great Britain and No. 2 seed Kimmer Coppejans of Belgium will play for the other place in the final. Mitchell Krueger and Noah Rubin of the US both lost on Tuesday. Complete results are available at the ITF junior website. The order of play and printable draws for Roehampton are available at the LTA website, which also includes the OOP for the Wimbledon qualifying matches being held there. I've fallen behind in my coverage of the US Open National Playoffs, but the USTA has sent out several press releases recently, parts of which I am posting below, if I hadn't already provided a complete sectional update earlier. There are too many juniors and college players to mention individually, but you'll recognize many of the names. The final three sectional qualifying events are this weekend--Missouri Valley, Southern and Midwest. Men’s Final – Dante Cipulli, 30, will also be making a return trip to the US Open National Playoffs – Men’s Singles Championship after defeating former Top 50 player Jeff Tarango, 43, in a tight 4-6, 6-4, 6-4 match in Claremont, Calif. Cipulli won the 2010 USTA Missouri Valley Sectional Qualifying Tournament to advance to the US Open National Playoffs – Men’s Championship. He is a former assistant coach at the University of Missouri-Kansas City and currently works as a teaching pro and junior tennis coach in Murrieta, Calif. Tarango was the doubles runner-up at the 1999 French Open with Goran Ivanisivec. He won 14 ATP doubles titles in his career and peaked at No. 10 in the world doubles rankings in 1999 and No. 42 in singles in 1992. Women’s Final – No. 1 seed Mayo Hibi, 16, of Irvine, Calif., lost just seven games in four matches to win the women’s title, defeating 17-year-old Alyssa Smith, of Laguna Niguel, Calif., 6-3, 6-1, in the final. Hibi, from Japan, won the $10,000 USTA Pro Circuit event in Hilton Head Island, S.C., earlier this month and is No. 646 in the WTA rankings. She also reached the semifinals of the 2012 Easter Bowl as a junior player. Off the court, Hibi enjoys music, taking piano lessons and playing the clarinet at her school. Mixed Doubles Final – West Nott, 30, of Los Angeles, and Alison Ramos, 22, of Carson, Calif., won the mixed doubles title in a close match against Page Bartelt and Scott Doerner, 4-6, 6-4, [10-8]. Nott and Ramos also won their semifinal match in a tight third-set tie-break, 12-10. Nott is a current assistant coach at USC and competes in Davis Cup as a member of the Pacific Oceania team, having been born in the Marshall Islands and living on an island in Micronesia until the age of 11. In college, Nott played one year at Florida before transferring to Georgia Tech. As a junior, he was consistently ranked No. 1 in the USTA Midwest Section. Teaming with his mother, Elizabeth, Nott won the 2006 National Mother-Son Doubles Championships in 2006 and reached the final in 2010. Nott also spent six months as the full-time coach for Canadian Rebecca Marino, who is now ranked in the WTA’s Top 100. Ramos graduated from USC in the spring, where she played in the school’s fifth and sixth singles positions and was ranked in the Top 75 in the country in doubles as a junior and senior, finishing her junior year ranked No. 28. Men’s Final – In New Haven, Conn., future Stanford Cardinal Nolan Paige,18, of Fairfield, Conn., won six matches and defeated Fordham University sophomore Srikar Alla in a 5-7, 6-4, 6-2 final. Paige won the 2010 USTA New England sectional qualifier but was unable to compete in the US Open National Playoffs due to a scheduling conflict. Paige, who has won numerous New England tennis titles, comes from a tennis family; his father is the head men’s and women’s tennis coach at Fairfield University. Women’s Final – 2010 USTA Florida sectional qualifier champion Jan Abaza, 17, of Boca Raton, Fla., won the women’s title, defeating No. 2 seed and University of Pennsylvania standout Chieh Yu Hsu, 20, of Philadelphia, 7-5, 6-2, in the final. Abaza also upset No. 1 seed and 2011 USTA New England sectional champion Lena Litvak in the semifinals. Abaza has trained in Boca Raton for 10 years and is currently ranked No. 701. Due to a scheduling conflict, Abaza was unable to play in the Florida sectional qualifier, so she made the trip up to New England, as she has family in New Jersey. Abaza won the doubles title at the $10,000 USTA Pro Circuit event in Sumter, S.C., this year and was a standout junior, reaching the girls’ 14s quarterfinals at the 2008 Junior Orange Bowl. Mixed Doubles Final – Paige had a chance to add another title as he advanced to the mixed doubles final with 18-year-old Ashley Noyes, but the pair fell to 14-year-old Meghan Kelley, of Falmouth, Maine, and Daniel Quiceno, 32, of Beverly, Mass., 6-3, 6-4. Quiceno is a teaching pro at Manchester Athletic Club in Massachusetts, where Kelley trains. He was the No. 1-ranked player in his native Colombia from age 8 to 18 and played collegiately at Troy University. He worked at the Bollettieri Academy and has been a hitting partner for Tommy Haas, Maria Sharapova and Xavier Malisse, among others. 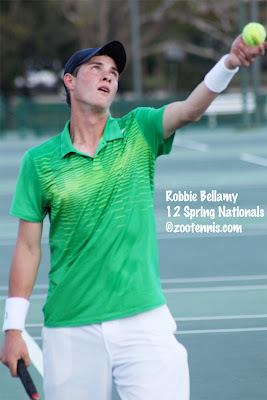 Kelley, the youngest player to have won a sectional qualifier so far, has won a number of national junior tournaments. The USTA Texas, Northern California and Northern Sectional Qualifying Tournaments of the 2012 US Open National Playoffs were all completed in the past week, advancing 11 additional players to the US Open National Playoffs – Men’s, Women’s and Mixed Doubles Championships in August. Men’s Final – In the largest sectional qualifying tournament of 2012, with nearly 160 total singles and mixed doubles entries, former University of Texas player Jon Wiegand, 24, of San Antonio, Texas, won six straight matches and then defeated defending champion Artem Baradach, 23, of Dallas, 2-6, 6-1, 7-6(2), in the final in Arlington. Wiegand was down a set and facing two break points in the first game of the second set before turning things around, cruising in the second set and winning the third set in a decisive tie-break. Wiegand played for the University of Texas from 2006 to 2010 and is now a color analyst for the Longhorn Network. His dad, uncle and sister all played at Texas. Women’s Final – Peggy Porter, a 16-year-old Dallas native, defeated Elena Kordolaimi, 19, of Nacogdoches, Texas, 3-6, 6-0, 6-2, in the final. Porter, who won five matches for the title, is a standout junior player who played in her first junior Grand Slam tournament last year at the US Open, where she lost in two tie-breaks. 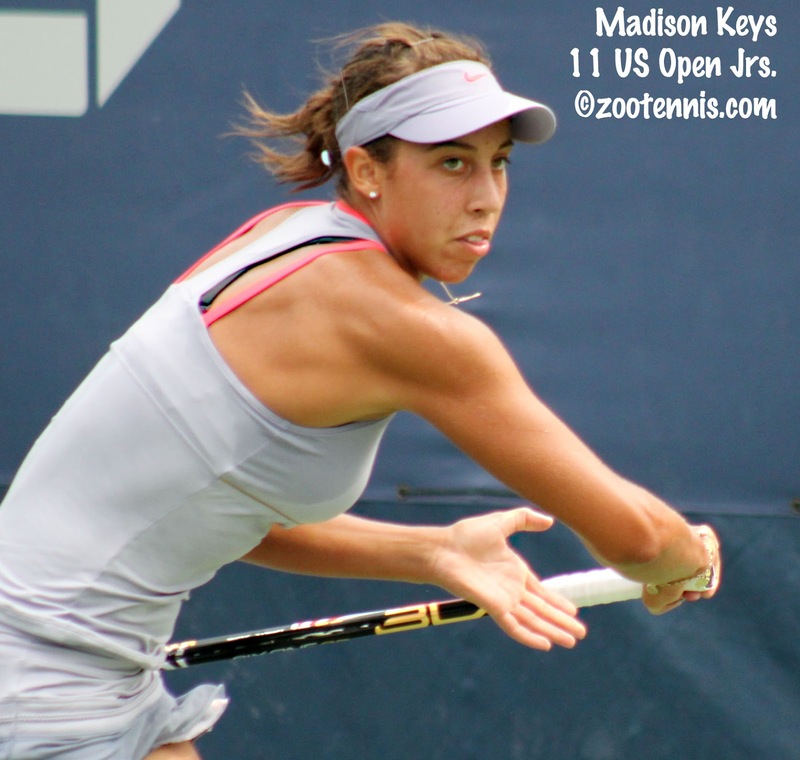 Also in 2011, she won both the singles and doubles title at the 2011 USTA Girls’ 16s National Clay Court Championships and took the title at the USTA Girls’ 16s National Championships. This year, Porter advanced to the quarterfinals of the International Grass Court Championships, a prestigious grass-court junior event. Mixed Doubles Final – For the second consecutive year, siblings Samantha and Harrison Adams, of New Braunfels, Texas, took home the title in Texas, defeating Porter and her partner, Josh Hagar, 18, of Austin, 4-6, 6-2, [10-5]. Samantha, 20, is the No. 2 singles player and No. 1 doubles player for the Texas Tech women’s tennis team. As a freshman, she was named the ITA Rookie of the Year for the Texas Region, and this past year she and partner Kenna Kilgo posted the highest-ever ITA doubles ranking in Red Raiders’ women’s tennis history, at No. 15; Samantha also won the Texas high school state title three times. Harrison, 18, will graduate from high school in 2013 and has won the 5A state title twice. He is his high school’s class president. The duo said that they plan to spend the summer individually training for the US Open National Playoffs. However, Samantha and Harrison are two of seven kids, all of who play tennis, so practice will not be a problem. Men’s and Mixed Doubles Final – In Salinas, Calif., former UCLA standout Nicolas Meister, 23, of Trabuco Canyon, Calif., became the just second man to sweep the singles and mixed doubles at a sectional qualifying tournament this year, claiming the singles title and teaming with Stanford star Hilary Barte to win the mixed doubles in Salinas, Calif. Meister swept both titles without dropping a set in either event. He was pushed in only one of his five singles matches, defeating Eugene Muchynski in the semifinals, 7-5, 6-2, before dismissing Brandon Sutter in the final, 6-2, 6-1. With the victory, Meister joins Brian Battistone, who opened the 2012 US Open Playoffs by sweeping the Southwest sectional qualifier, as the only dual winners on the men’s side. Meister then teamed with Barte, 23, of Newhall, Calif., to defeat Giuliana Olmos and Duncan Mugabe, 6-3, 7-6, in the mixed doubles final. Meister was an All-American doubles player as a junior at UCLA in 2010 but missed most of the 2011 season following hip surgery; after receiving a medical redshirt, he returned in style this past year to earn a Top 16 seeding into the 2012 NCAA Tournament, taking home singles All-American honors in the process. Barte is an eight-time collegiate All-American (singles and doubles all four years) and won the NCAA doubles title in 2011 and 2012 (with Lindsay Burdette and Mallory Burdette, respectively); she is currently ranked No. 323 in the world in doubles. Women’s Final – Olmos, 19, of Fremont, Calif., did not go home empty-handed, winning her three singles matches with ease, dropping just 12 games in six sets. She defeated Stephanie Lin, 17, of Pinole, Calif., 6-0, 6-3, in the final. Olmos was born in Austria but competes for Mexico. She played on the Mexican Fed Cup team in 2010, going 2-1 in singles, and played for Mexico’s Junior Fed Cup team in 2009, going undefeated at the No. 1 position. Men’s Final – In Minneapolis, Evan Song, 20, of Las Vegas, defeated Wyatt McCoy, 19, of St. Paul, Minn., 6-1, 7-6(6). Song, who defeated defending champion Tony Larson in the semifinals, currently plays on the USTA Pro Circuit and in ITF-level events. This year, he competed overseas in Greece, Bahrain, Panama and Guatemala, in addition to playing on the USTA Pro Circuit. As a junior player, he reached the semifinals of the 2010 Easter Bowl, upsetting No. 2 seed Dennis Novikov en route. Women’s Final – The third time was a charm for 15-year-old Nyla Beenk, of LeClaire, Iowa, after defeating 13-year-old Alexis Nelson, of St. Paul, Minn., 2-6, 6-1, 6-4. Two years ago, Beenk was a finalist at the Northern Sectional Qualifying Tournament, and she was a semifinalist last year. Beenk has played in many USTA junior tournaments. For the past two years, she has played in qualifying in USTA Pro Circuit events, and this May she qualified for her first-ever pro main draw at the $10,000 event in Landisville, Pa.
Mixed Doubles Final – Jessie Aney, 14, and Eric Frueh, 19, both of Rochester, Minn., won a close mixed doubles final against Chris Johnson, 19, and Amber Washington, 17, both of St. Paul, Minn., 5-7, 6-1, [10-3]. Aney was named the 2010 Sports Illustrated “SportsKid of the Year”— the first girl to ever receive the award—and appeared on the cover of the December 2010 issue of Sports Illustrated For Kids. 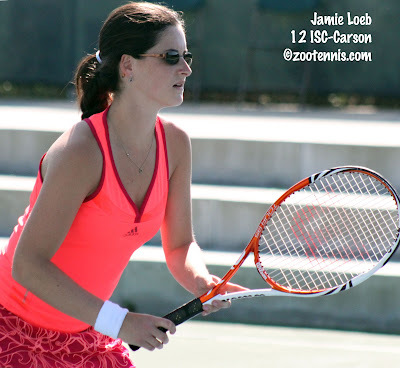 She has worked with USTA Player Development and won a state singles title while in eighth grade. Frueh is a sophomore at the University of Minnesota. The winners or top available finishers from each of the 13 sectional qualifying tournaments held throughout the spring and summer advance to the US Open National Playoffs – Men’s, Women’s and Mixed Doubles Championships, to be held during the New Haven Open at Yale, an Emirates Airline US Open Series women’s event, in August. The US Open National Playoffs mixed doubles champions receive a main draw wild card into the 2012 US Open, while the men’s and women’s singles champions earn a wild card into the US Open Qualifying Tournament held the week prior to the US Open. The tennis world in general and college tennis in particular suffered a substantial and unexpected loss yesterday when referee Jim Russell, known as Big Jim to one and all, died at his home in Belton, South Carolina at age 67. 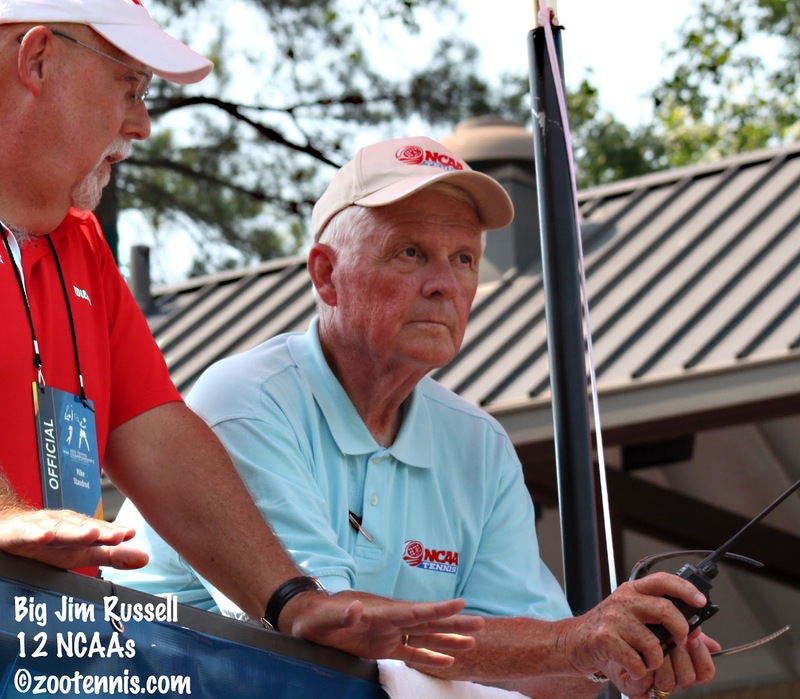 Russell was the tournament referee for the NCAA Division I men's championships for 22 years, and also served in that capacity for the ITA Men's All-American Championships and the USTA/ITA Indoor Intercollegiate Championships. I also saw Russell every year at the US Open, where he was in charge of the Champions Invitational event for past tennis greats, and I'm sure that's just a fraction of the tournaments he was involved in. He also was a big part of USTA junior tennis in South Carolina, and served as president of the South Carolina Tennis Association and the USTA Southern section, in addition to his work on numerous USTA national committees. He was inducted into the USTA Southern section Hall of Fame in 2005 and the ITA College Tennis Hall of Fame in 2003. For more on Russell's early background, see this biographical entry at the Belton Tennis Center website, which was published when he was inducted into the South Carolina Tennis Hall of Fame in 1991. In his classic Southern drawl, Russell could make any conversation easy listening, whether he was telling a story or making a ruling on the court. As knowledgeable as he was gracious, Russell was never at a loss, and his ability to listen first and decide later made him the perfect person to wield the power of a referee. Compared to many others, my acquaintance with Russell was brief, but it took me less than seven days to realize what a special person he was when I first met him at the 2005 NCAAs. His passing leaves college tennis with a huge gap, one that will be felt for a very long time. The following funeral arrangements have been made: Visitation at the home (717 Brown Avenue, Belton, SC) Thursday 6:00 to 8:00. Service at the Belton Presbyterian Church (405 Holmes Street, Belton, SC) Friday morning at 11:00 followed by a graveside service at the Belton Cemetery (Anderson Street, Belton, SC). In lieu of flowers, contributions may be made to your choice of: Belton Presbyterian Church, PO Box 601, Belton, SC 29627; South Carolina Tennis Patrons Foundation, PO Box 843, Belton, SC 29627; or Belton Rescue Squad, 107 South Main Street, Belton, SC 29627. Tennis parents come from all walks of life, but not many have their own television shows on Fox News as Sean Hannity does. I admit to being vaguely aware that he had an interest in tennis and children who played from a post Peter Bodo did a couple of years ago at TennisWorld, but until today, our interests never intersected. (I vote, but I'm not much interested in political commentary, whether it's Fox or MSNBC). Because I've never watched his show, I don't have any preconceived notions about him, so when I heard he had written an article decrying the recent changes in the USTA junior competition format and schedule, I wasn't sure what to expect. Hannity explains calmly and clearly why he thinks the changes are a mistake, focusing on the lack of national opportunities and what he believes are the consequences of those cutbacks. When you talk to juniors, coaches, tournament directors, umpires, and parents at junior tournaments, which I do almost every weekend, almost all are against these changes. It is clear that if any junior tennis players, coaches, tournament directors, and parents were consulted, the sample must have been very small. Hannity may have a large audience and devoted followers in the political arena, but I'm unsure what influence he may have in motivating the USTA sections to reconsider their votes. This is a conversation worth having however, whether it ultimately succeeds or not, so if you would like to contact your section again, the phone numbers can be found in the Tom Walker post I linked to above. The United States Olympic team was announced today, with Andy Roddick, John Isner, Ryan Harrison and Donald Young the men's singles players for the USA, and Roddick, Isner and the Bryan twins the doubles teams. The women's team will consist of the Williams sisters, Vavara Lepchenko and Christina McHale in singles and the Williams sisters and Liezel Huber and Lisa Raymond in doubles. Two-time NCAA champion at Virginia Somdev Devvarman, who has been out with an injury, received a wild card into the singles for India. An even dozen Americans took the courts today for first round matches at Wimbledon, with only five managing to advance to the second round. Although she wasn't seeded, Venus Williams' loss to Elena Vesnina of Russia was probably the biggest surprise, because even though she hasn't been a factor since being diagnosed with Sjogren's Syndrome, Williams has always been a threat at the All England Club. John Isner, the No. 11 seed, had a match point in the fourth set tiebreaker with Colombia's Alejandro Falla but wound up losing 6-4, 6-7(7), 3-6, 7-6(7), 7-5. James Blake lost to Baylor's 2004 NCAA champion Benjamin Becker of Germany and Donald Young lost to No. 26 seed Mikhail Youzhny of Russia. For an interesting take on that match, see Howard Bryant's piece for espn.com. Qualifiers Michael Russell and Ryan Sweeting picked up wins, as did Ryan Harrison, who will face defending champion and world No. 1 Novak Djokovic in the second round. Melanie Oudin lost to Timea Babos of Hungary and Vania King went quietly against No. 23 seed Petra Cetkovska of the Czech Republic, but Sloane Stephens and Jamie Hampton advanced. Stephens had no trouble with qualifier Karolina Pliskova of the Czech Republic in their second meeting, posting a 6-2, 6-2 win. At the 2010 US Open Junior Championships, Stephens beat Pliskova 3-6, 6-4, 6-3 in the quarterfinals. Hampton took out No. 27 seed Daniela Hantuchova of Slovakia 6-4, 7-6(1) and will next play wild card Heather Watson of Great Britain. Christina McHale, the No. 28 seed, twice served for the match against British wild card Joanna Konta, but couldn't convert either time and their match was suspended due to darkness at 7-7 in the third set. Tuesday has ten Americans playing their first round matches: Irina Falconi, Andy Roddick, Serena Williams, Jesse Levine, Wayne Odesnik, Mardy Fish, Brian Baker, Varvara Lepchenko, Sam Querrey and CoCo Vandeweghe. For the schedule and draws, see the Wimbledon website. At the Grade 1 ITF in Roehampton today, the unfinished first round and the second round were completed, with six US juniors surviving into the third round. Top seed Taylor Townsend is the only American girl in the top half, but in the bottom half, Allie Kiick(8), Sachia Vickery(4) and Kyle McPhillips are still alive. In the boys draw, the two remaining Americans are Mitchell Krueger(7), in the top half, and Noah Rubin(13), in the bottom half. With all the havoc caused by tropical storm Debby, it was this evening before the result of the Indian Harbour Beach Futures final was known. 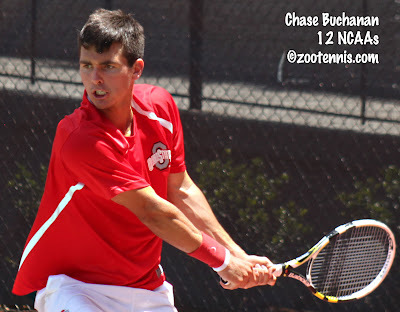 Chase Buchanan defeated Alex Domijan 6-3, 6-4 to win his first Futures since Vero Beach in 2008. Ruben Gonzales and Darian King won the doubles over Georgia Tech's Juan Spir and Kevin King 6-2, 3-6, 10-4. Torrential rain has caused problems on the other side of the state as well, where the Innisbrook Futures qualifying is taking place. This has left two final round qualifying matches unfinished, but those and some main draw matches are on the schedule for Tuesday. For results, see the Pro Circuit page at usta.com. There were a couple of assistant announcements today, with Ryan Keckley, who has been the men's assistant coach at the University of San Diego for the past three years, joining Billy Pate at Princeton in the same capacity, and Ryler DeHeart, an all-American at Illinois, taking the assistant position for new Alabama coach George Husack. The Princeton announcement is here and the Alabama announcement is here. It's just hours until Wimbledon begins, although the junior championships, which I'll be covering live are still six days away. A dozensAmericans are on the schedule for Monday's first round: Venus Williams, John Isner, Jamie Hampton, Vania King, Sloan Stephens, Melanie Oudin, James Blake, Ryan Harrison, Christina McHale, Donald Young and qualifiers Ryan Sweeting and Michael Russell. For the complete order of play see the Wimbledon website. Heavy rains in Florida postponed the finals of the $10,000 Pro Circuit Futures in Indian Harbour Beach, with Chase Buchanan and Alex Domijan now scheduled to play for the championship on Monday at 9 a.m. The doubles final, between Georgia Tech's Juan Spir and Kevin King and Ruben Gonzales anf Darian King was also pushed back until Monday. For more on the delay, see this article from Florida Today. The qualifying for the Innisbrook, Fla. Futures was also rained out, with two more rounds scheduled to be played before the qualifiers are determined. For that draw, see the Pro Circuit page at usta.com. At the $10,000 women's Pro Circuit tournament in Williamsburg, Va., Vojislava Lukic of Serbia beat qualifier Caroline Doyle of the US 6-1, 6-3 to win her second consecutive title. The 25-year-old won at Bethany Beach last week as a qualifier. Top seeds DEIGMAN, Laura Deigman of Great Britain and Julia Moriarty of Ireland took the doubles title 6-4, 6-4 over Americans Jacqueline Cako and Whitney Jones, the No. 2 seeds. The University of Michigan has announced the transfer of Spencer Newman for the upcoming season. The former Florida Gator will join the Wolverines as a junior. For the complete release, see the University of Michigan website. And according to this article on current University of Illinois player Farris Gosea's title at a local open tournament, Blake Bazarnik has transferred from Vanderbilt to Illinois. At the Grade 1 at Roehampton today, the first round of play wasn't completed, but Taylor Townsend won her opener 6-2, 6-0 over Elke Lemmens of Belgium. Kyle McPhillips and No. 4 seed Sachia Vickery of the US advanced, but No. 5 seed Chalena Scholl and Jennifer Brady lost their first round matches. Allie Kiick, seeded eighth, did not play. In the boys first round, Mitchell Krueger(7), Noah Rubin(13), Mackenzie McDonald(14) and qualifier Stefan Kozlov won their first round matches. Spencer Papa lost, and Alexios Halebian and Connor Farren did not play. No. 4 seed Filip Peliwoo of Canada, the Australian and French boys finalist this year, fell to Enzo Couacaud of France. Top seed Luke Saville of Australia and Luke Bambridge of Great Britain did not play their opening match. Complete results are available at the LTA site. At the other grass warmup to Wimbledon, the Grade 2 Gerry Weber in the Netherlands, top seed Nikola Milojevic of Serbia and No. 2 seed Marcela Zacarias of Mexico claimed the singles titles. Blair Shankle, the only US player in either draw, lost in the girls doubles final. Paired with Laura Ucros of Colombia, Shankle lost to Barbora Krejcikova and Dominka Paterova of the Czech Republic. The boys doubles title was won by Markos Kalovelonis of Greece and Stefano Napolitano of Italy. All-Americans Chase Buchanan and Alex Domijan will meet on Sunday for the singles championships of the $10,000 Pro Circuit Futures tournament in Indian Harbour Beach, Florida. Buchanan, who just turned 21 and completed his eligibility at Ohio State last month, beat 18-year-old Christian Harrison in the semifinals 7-6(4), 6-4, while Domijan, the 20-year-old who recently completed his sophomore year at Virginia, defeated No. 6 seed Bjorn Fratangelo 4-6, 6-1, 6-1. Neither Buchanan nor Domijan is seeded this week. In their meetings as juniors, Buchanan had the upper hand, winning all three times they played in major ITF events, but in college competition, Domijan has a 2-0 record, winning twice over Buchanan in the 2011 dual match season, including in the semifinals of the NCAA team championships. Buchanan is seeking his second Pro Circuit singles title; his first came way back in 2008, when he won the Vero Beach Futures, which was also played on clay. Domijan is looking for his first Pro Circuit title. I have not tried to watch myself, but the USTA is advertising live streaming for the tournament at the spacecoastsportstv site, which streamed the women's $50,000 tournament this spring. Buchanan had beaten teammate Blaz Rola in the quarterfinals, and Florida Today published a lengthy story about their match Friday. In it, Rola reveals that he is not playing the fall college season, concentrating instead on Futures events in Europe, but is planning to return to Ohio State for the dual match season in 2013. Complete draws can be found at the Pro Circuit results page. At the women's $10,000 Pro Circuit event in Williamsburg, Va., Caroline Doyle keeps rolling along, reaching the final with a 6-1, 6-2 win over No. 5 seed Nika Kukharchuk of Russia. The 16-year-old Doyle, who had never qualified for the main draw of a Pro Circuit event in three tries and has no WTA ranking, dropped only one set in her three qualifying matches this week, and hasn't lost any sets in her four main draw wins. She will attempt to end the winning streak of Vojislava Lukic of Serbia, who won the Bethany Beach $10,000 tournament last week as a qualifier, and is through to the finals this week on a special exemption. The 25-year-old has a collegiate connection according to her wikipedia page, but the reason for her long break from the game remains a mystery. The complete draws can be found at the Pro Circuit results page. The draws for the Grade 1 ITF in Roehampton, the warm-up for Wimbledon's junior championships, have been posted. The most notable news is the appearance of Connor Farren, who told me back in April he didn't know if he would be able to play, due to a wrist injury, prior to Kalamazoo. Roehampton will be his first tournament since the Australian Open juniors back in January. Other American boys in the draw are Alexios Halebian, Stefan Kozlov, Mitchell Krueger(7), Mackenzie McDonald(14), Spencer Papa and Noah Rubin(13). There are six US girls in the draw and four of them are seeded: Taylor Townsend(1), Sachia Vickery(4), Chalena Scholl(5) and Allie Kiick(8). Kyle McPhillips and Jennifer Brady are the unseeded US players. Christina Makarova was in the acceptances, but is not in the draw, and has not played a match in over a month. The draws and schedule can be found on the home page of the LTA website. At the NCAA tournament last month, I had an opportunity to talk with Lisa Stone, the tennis parent behind the blog Parenting Aces. Although we had gotten to know each other via the email-twitter-blog route so common these days, a face-to-face meeting was welcome, as was the chance to talk with her about the motivation and the challenges of starting a personal blog. Unlike Zootennis, which I think of as a personal blog in some ways, but mostly consider a information source, Parenting Aces reverses that ratio, I think. Stone provides advice from experts regularly, but she also directly addresses her own emotions and experiences as the mother of a 15-year-old junior tennis player. For all the tennis parents who are out there, few want to tread that bumpy path publicly for a variety of good reasons. But when someone is bold enough to undertake that, and willing to do so without the cover of anonymity, she deserves the thanks of all of us who care about the sport. In this interview, which went up today at the Tennis Recruiting Network, Stone shares her inspiration for starting the blog, the impact it has had on her relationship with her son and husband, and why she thinks she'll continue to explore junior tennis issues in the next few years. She has written two interesting posts this week, one on the difference between a pusher and a grinder (such a critical distinction among junior tennis players) and the second on 'the other' tennis parent in a family. The LTA Junior Challenge Trophy exhibition between boys teams from Great Britain and the United States wrapped up today in Eastbourne, with Great Britain's team of Peter Ashley, Luke Bambridge, Liam Broady, Kyle Edmund and Joshua Ward-Hibbert defeating the United States team of Mitchell Krueger, Alexios Halebian, Mackenzie McDonald, Spencer Papa and Noah Rubin 6-2. I believe the two US wins came from Papa (over Bambridge) and Krueger (over Ward-Hibbert). The next competition for all those boys will be at the ITF Grade 1 in Roehampton, which starts on Sunday. The qualifying was completed today, with Stefan Kozlov the sole American to advance to the main draw. Thai Kwiatkowski lost in the second round, while Austin Siegel and Catherine Harrison lost in the first round. At the $10,000 women's Pro Circuit event in Williamsburg, Va., 16-year-old qualifier Caroline Doyle defeated No. 6 seed Jacqueline Cako 6-4, 6-3 to advance to the semifinals. She will play No. 5 seed Nika Kukharchuk Saturday. For complete results, see the Pro Circuit results page at usta.com. 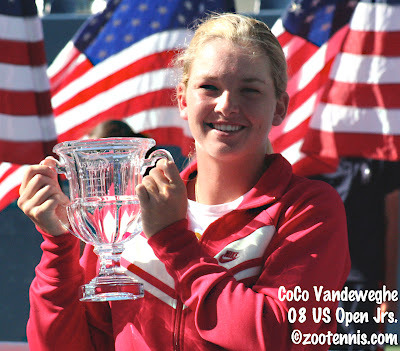 Despite several rain delays, women's qualifying did finish today at Wimbledon, with American CoCo Vandeweghe advancing to the main draw. Vandeweghe, seeded 14th, trailed 11th seed Lara Arruabarrena-Vecin of Spain 5-3 in the final set, and Arruabarrena-Vecin served for the match at 5-4, but Vandeweghe broke at 30-40, quickly held serve and broke again for a 6-2, 6-7(2), 7-5 victory. Alex Glatch, the other American in the final round of qualifying, lost to Camila Giorgi of Italy 7-6(5), 6-2. Earlier, 18-year-old German Annika Beck had qualified with a 6-3, 6-4 win over Petra Rampre. Beck has had a memorable month, winning the French Open girls title then qualifying for her first slam, on grass, less than two weeks later. Beck isn't the only reigning junior slam champion in the Wimbledon draw, or even the youngest player, with 16-year-old 2011 Wimbledon girls champion and wild card Ashleigh Barty of Australia having that distinction. But it got me thinking about former junior slam winners who made it through, and after some research, I found that six women, exactly half of the qualifiers, had won a singles title at a junior slam. In addition to Beck and 2008 US Open girls champion Vandeweghe, Karolina Pliskova and Kristyna Pliskova of the Czech Republic, Kristina Mladenovic of France and Mirjana Lucic of Croatia also have junior slams on their resume. Karolina won the 2010 Australian girls title, her twin sister won Wimbledon that same year, and Mladenovic, still only 19, won Roland Garros in 2009. Lucic, who at 30 is the only one of the six older than 20, won two junior slams, the US Open in 1996 and the Australian Open in 1997. The Wimbledon website has an article about Lucic, who was a ladies semifinalist in 1999, and about the Pliskova twins. Among the men's qualifiers, only two of the 16 won junior slams: Andrey Kuznetsov of Russia, who won Wimbledon in 2009, and Ryan Sweeting, the 2005 US Open boys champion. For more on all 16 of the men's qualifiers, see this post from the blog Foot Soldiers of Tennis. Wimbledon also holds doubles qualifying, with Bobby Reynolds of the US teaming with former Old Dominion star Izak Van Der Merwe to reach the men's main draw, and Lindsay Lee-Waters and Megan Moulton-Levy, the latter formerly of William and Mary, qualifying on the women's side. Speaking of William and Mary, the school announced today that Tyler Thomson, who was head women's coach at Minnesota for 13 years, had been named to that position in Williamsburg, Va. The complete release is here. Jack Sock has received a wild card into the ATP Campbell's Hall of Fame Championships next month in Newport, Rhode Island. The local newspaper, the Newport Daily News did a lengthy story about Sock, but unfortunately there is no link available, with the story behind a paywall. Here are a few comments from Sock, who is recovering from surgery in March and is currently training with Gil Reyes, Darren Cahill and Andre Agassi in Las Vegas. His top school choice was Nebraska, where his brother Eric plays on the men’s team. “I would have loved to go play with my brother and all those guys on the team who are very good friends of mine,” Sock said. Sock has also been given a wild card into the main draw of the BB&T Open in Atlanta, which is the week after Newport. Georgia Tech's website published an article a few days ago saying that graduating senior Kevin King and University of Georgia freshman Nathan Pasha had been awarded qualifying singles wild cards into the BB&T, but that article has been taken down. The article also said King and Ignacio Taboada of Georgia were given a main draw wild card into the doubles. Whether that's still the case, I don't know. Brian Baker will play in his first Wimbledon (although he did play there as a junior) next week after winning his final round qualifying match over Maxime Teixeira of France 5-7, 6-2, 6-1, 6-2 today at Roehampton. For more on Baker's win, see wimbledon.com. Baker will be joined in the main draw by Jesse Levine, who beat Wayne Odesnik 7-6(3), 6-1, 6-2, Michael Russell, who battled through Yuichi Sugita of Japan 6-3, 4-6, 6-3, 4-6, 6-2 and Ryan Sweeting, who had an inspiring comeback win over Peter Torebko of Germany, saving a match point in his 3-6, 1-6, 7-6(3), 7-5, 6-4 victory. With four qualifiers, the US has the most of any nation, with France and Spain the only other countries with multiple qualifiers, with three and two respectively. Adding the seven direct entries, there will be at least 11 US men in the main draw (there is still a lucky loser position to be filled with the Monfils withdrawal). According to this ATP news release, which features interesting information about all the American qualifiers, Estonia will now have its first male participant in a slam main draw, with Jurgen Zopp qualifying today. In the women's qualifying, Madison Keys and Alison Riske fell in today's second round, but Alexa Glatch and CoCo Vandeweghe reached the final round with straight-set victories. The unseeded Glatch beat No. 17 Aravane Rezai of France 7-6(5), 6-2, and No. 14 seed Vandweghe defeated Germany's Katherin Woerle 6-4, 6-4. Glatch meets unseeded Camila Giorgi of Italy and Vandeweghe faces No. 11 seed Lara Arruabarrena-Vecin of Spain in Thursday's final round of qualifying. Eighteen-year-old Annika Beck, who won the French Open girls title a few weeks ago, remains alive for a main draw spot after a win today. She will play Petra Rampre of Slovenia, who is 32, in Thursday's final round. At Eastbourne, the site of the joint WTA and ATP event, a team of boys from the United States will play a team of British boys in a new event, called the LTA Junior Challenge Trophy. Great Britain, which won the Junior Davis Cup last year, will be represented by Luke Bambridge, Liam Broady, Joshua Ward-Hibbert, Peter Ashley and Kyle Edmund, which is a formidable team. The United States will counter with Alexios Halebian, Mitchell Krueger, Mackenzie McDonald, Spencer Papa and Noah Rubin, which is also a very strong team. A photo of the US team is available at this link. For more on the British team, see the LTA website. The qualifying for the ITF Junior Grade 1 at Roehampton begins on Thursday and there are four Americans participating: Thai Kwiatkowski, Stefan Kozlov and Austin Siegel in the boys draw; Catherine Harrison, who also qualified at Roehampton last year, in the girls. The qualifying for Roehampton, by the way, is not at Roehampton, but at another site. Typically the draws for this event are very strong, as nearly all the juniors coming to play Wimbledon enter there to begin adapting to the surface. A dozen US men began Wimbledon qualifying on Monday and seven still remain in the hunt for the 16 spots in the main draw after Tuesday's second round. No. 4 seed Michael Russell defeated Austria Andreas Haider-Maurer 6-3, 6-4; No. 5 seed Jesse Levine got past Japan's Hiroki Moriya 7-5, 6-7(2), 6-0; No. 8 seed Rajeev Ram downed Carlos Salamanca of Columbia 7-6(6), 6-4; No. 11 Brian Baker beat German Denis Gremelmayr 6-2, 6-4; No. 20 Wayne Odesnik defeated Peter Polansky of Canada 7-6(5), 6-3 and No. 21 Ryan Sweeting beat Stephane Robert of France 6-4, 6-2. Denis Kudla is the only American unseeded in qualifying who still remains alive; he defeated Simone Vagnozzi of Italy 6-2, 6-4. The 19-year-old from Virginia has already succeeded in qualifying for a slam in Australia this year, but he lost in the second round of qualifying at the French and didn't have great results in the two grass court tournaments he played the past two weeks. He lost in the first round of the first Nottingham challenger as an alternate, and then in qualifying for the ATP event at Queen's Club, he won one match in a third-set tiebreaker, then lost his next one the same way. On Wednesday he will play No. 24 Jerzy Janowicz of Poland for a place in the Wimbledon main draw. With so many Americans, it's odd that more didn't play each other, with Sweeting and Alex Kuznetsov's meeting the only such contest. There's another on Wednesday however, as Levine and Odesnik will play for the main draw. Junior Kyle Edmund lost in three sets today to Marcel Felder of Uruguay, and after Chris Eaton's loss earlier in the day, that meant no British men reached the third round of qualifying. One of the young qualifying wild cards, 17-year-old Luke Bambridge, who lost in Monday's first round, is the subject of this extensive profile by BBC Sport. The US women, who were a big story in the early going at the French, were less impressive in the opening round of the Wimbledon qualifying today. Four of the ten who started made it through, including 17-year-old Madison Keys, who defeated Marta Domachowska of Poland 6-1, 6-3. She is joined by CoCo Vandeweghe(14), Alison Riske and Alexa Glatch. Grace Min was up a break in the final set against No. 8 seed Stefanie Voegele of Switzerland before falling 6-4, 1-6, 7-5. In addition to Keys, two other juniors advanced to the second round of qualifying: French Open girls champion Annika Beck of Germany and China's Saisai Zheng. In the other professional grass tournaments today, Christina McHale beat former world No. 1 Caroline Wozniacki again (for more on all the upsets at that WTA Eastbourne event, see this account at tennis. com) and 2010 World Junior champion Daria Gavrilova of Russia, still just 18, got her first Top 100 WTA win. Gavrilova, a qualifier, beat No. 35 Yanina Wickmayer of Belgium 6-1, 6-2 at the Den Bosch WTA tournament. Gavrilova will play another Belgian, Kirsten Flipkens, also a qualifier, who upset top seed Samantha Stosur of Australia in the first round. In junior Wimbledon news, two prominent players have withdrawn: Czech Adam Pavlasek, who reached the semifinals of the previous two junior slams this year, and Anna Schmiedlova of Slovakia, who was in the girls final earlier this month at Roland Garros. Here's quick recap of last week's Pro Circuit events and a look at this week's. At the $10,000 in Bethany Beach, Delaware, qualifier Vojislava Lukic of Serbia beat Sanaz Marand of the US 6-2, 7-5 in the final. Marand and Jacqueline Cako won the doubles title, beating top seeds Anastasia Kharchenko of Ukraine and Nika Kukharchuk of Russia 6-1, 6-2. At the $15,000 Futures in Chico, Calif., unseeded Phillip Simmonds beat No. 3 seed Michael McClune 4-6, 6-2, 6-2 for his first Pro Circuit singles title of 2012. No. 2 seeds Devin Britton and Jordan Cox won the doubles, defeating top seeds Daniel King-Turner of New Zealand and Nima Roshan of Australia in a 6-7(6), 7-6(8), 10-7 thriller. It is Britton's sixth doubles title on the Futures circuit this year, with four different partners. This week the men are back on clay at a $10,000 tournament in Indian Harbour Beach, Fla. It is the first tournament for the USTA's Collegiate team, and in today's first round, two of them met, with Mitchell Frank defeating Dennis Nevolo 1-6, 6-3, 6-3. This was a rematch of the final of the 2011 USTA/ITA Indoor Intercollegiate Championships, also won by Frank. The tournament is weak from a ranking standpoint, with top seed Greg Ouellette dropping out and No. 2 seed Roman Recarte of Venezuela losing today, so it will be interesting to see who can take advantage of the circumstances. The women are in Williamsburg, Va. for a $10,000 clay event of their own, and qualifying was completed today, as well as a few first round matches. Alexis King is the top seed again this week and Nadia Echeverria Alam is the No. 8 seed, despite a ranking of 872. Jacqueline Cako is in the draw, but she is the only member of the USTA women's summer collegiate team there. The opening round of qualifying at Wimbledon was good for American men, with nine of the 12 winning their first round matches. It wasn't a good day for the British men, with seven of the nine wild cards failing to advance to Tuesday's second round of play. The US men advancing were Michael Yani, Michael Russell(4), Jesse Levine(5) (10-8 in the third), Tim Smyczek, Ryan Sweeting(21), Rajeev Ram(8), Denis Kudla, Wayne Odesnik(20) and Brian Baker. Bobby Reynolds(14), was the only seeded American to lose, dropping a tough 11-9 in the third decision to Erik Chvojka of Canada. Alex Kuznetsov lost to Ryan Sweeting in the only all-American first rounder, and Robby Ginepri went out to Sergei Bubka of Ukraine. The only two British players to advance were Chris Eaton, who beat Australian teenager Ben Mitchell 7-6(4), 3-6, 6-4, and 17-year-old Kyle Edmund. Edmund had the best win of his brief career today, defeating No. 12 seed and current ATP No. 102 Daniel Gimeno-Traver of Spain 6-3, 6-7(4), 6-4. Edmund, whose ATP ranking is 1300, will play Marcel Felder of Uruguay Tuesday. In a somewhat surprising development, I haven't been able to find any press accounts of Edmund's win, but it ended late and today was busy, with the Birmingham final (which Melanie Oudin won over Jelena Jankovic), the start of the Eastbourne tournaments, and the David Nalbadian Queens Club default aftermath. I'm sure should Edmund post another win on Tuesday, he will get sufficient attention. The women's draw, which is 96, not 128 like the men's, is out and the first round of qualifying begins Tuesday for 12 main draw berths. There are ten American women in the qualifying draw: Tetiana Luzhanska, Madison Brengle, Madison Keys, Grace Min, Alison Riske, Gail Brodsky, Julia Cohen(19), Alex Glatch, CoCo Vandeweghe(14) and Jill Craybas. Keys and Min are among six juniors competing in the qualifying, and I am using the ITF age restrictions in determining that. French Open champion Annika Beck of Germany is joined by 2010 French girls champion Elina Svitolina of Ukraine, Saisai Zheng of China and wild card Katy Dunne of Great Britain. For the draws and results, see the Wimbledon website. In ITF Junior action, 14-year-old Ana Konjuh of Croatia continued her outstanding spring on the clay, winning the Grade 1 tournament in Offenbach, Germany last week. It is her fifth title of the year, and her second Grade 1 in as many months, and her ITF world junior ranking is now all the way up to 18. At the time of the French cutoff, it wasn't high enough to get her in there, but after her Grade 1 win last month, her ranking rose enough to receive entry into the main draw at Wimbledon. Orange Bowl 16s champion Hyeon Chung of Korea took the boys title in Offenbach, his first Grade 1 title. Chung, now ranked 22, will not be playing Wimbledon. In last week's Grade 4 in Guatemala, unseeded 14-year-old Ellie Halbauer of the US won her first ITF junior title. Halbauer beat No. 4 seed Jennifer Paola Artiga Henriquez of El Salvador 6-1, 6-3 in the final. Artiga Henriquez had beaten Halbauer in the final of the previous week's Grade 4 in El Salvador. The men's qualifying for Wimbledon begins Monday, with twelve Americans competing for the 16 available spots in the main draw. They are: Michael Russell(4), Jesse Levine(5), Rajeev Ram(8), Brian Baker(11), Bobby Reynolds(14), Wayne Odesnik(20), Ryan Sweeting(21), Michael Yani, Tim Smyczek, Denis Kudla, Alex Kuznetsov and Robby Ginepri. Brian Baker was really the only player among those 12 that was thought to be in the running for a main draw wild card, but he lost in the qualifying at Queen's and the last wild card went to Grega Zemlja, a 25-year-old from Slovenia, who won the Nottingham Challenger this week. There are three juniors in the qualifying, all British wild cards: Liam Broady, Kyle Edmund and Luke Bambridge. The schedule of play for Monday's qualifying, which is held at Roehampton, is here. The draw is here. 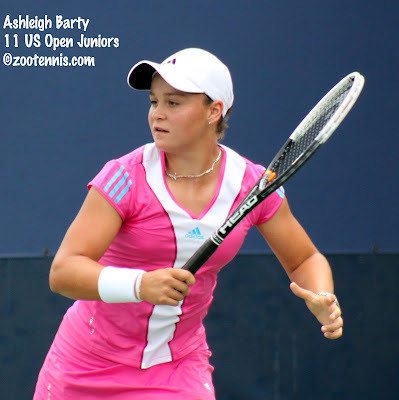 Two other wild cards were announced today, with 2011 Wimbledon girls champion Ashleigh Barty of Australia and Melanie Oudin of the US receiving them. Barty, 16, just won the singles and doubles titles at the $50,000 ITF Women's Circuit event in Nottingham and had already been granted a qualifying wild card, as is the tradition at the slams for the previous year's junior champion. 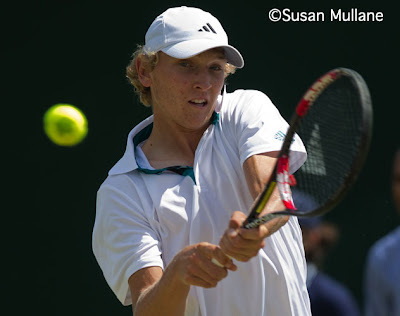 (2011 boys champion Luke Saville was originally announced as a qualifying wild card, but is not in the draw). It is Barty's third straight main draw slam wild card, having been given one into the Australian Open and into the French, getting Australia's reciprocal wild card there. She lost to Anna Tatishvili and Petra Kvitova, respectively, in the first round. Oudin has reached the final of the rain-plagued Birmingham WTA event as a qualifier and will play Jelena Jankovic in Monday's championship match. Oudin beat Irina Falconi in the resumption of their quarterfinal match 7-5 in the third today, then beat, in three sets, Ekaterina Makarova in the semifinals later in the day, and that was enough to impress the Wimbledon wild card committee. Oudin didn't even have a place in Wimbledon qualifying before her run in Birmingham, and she is playing in her second straight slam with a wild card. Oudin won the USTA's French Open reciprocal wild card and picked up a win in Paris. The complete list of Wimbledon wild cards can be found here. Also of note, 18-year-old Daria Gavrilova of Russia, the 2010 US Open girls champion, qualified into the main draw of the 's-Hertogenbosch, Netherlands WTA event this week. She will play Yanina Wickmayer in the first round. Jamie Loeb's ITF junior circuit winning streak continued today when she defeated Usue Arconada to claim the girls singles title at the ITF Grade 4 International Grass Court Championships in Philadelphia, Pa. The unseeded Loeb, who won the Delray Beach Florida Grade 4 on clay last month, defeated the 13-year-old Arconada, who now trains at the Junior Tennis Champions Center in College Park, 6-3, 6-3 to extend her winning streak to 11 matches. As in Delray, Loeb did not lose a set en route to the title. Another player with New York roots also put together a clay/grass double with a victory today in Philadelphia. No. 5 seed Dan Kerznerman's 6-3, 3-6, 6-1 win over doubles partner Henrik Wiersholm, the No. 4 seed, was Kerznerman's second ITF Grade 4 title in the past two months. 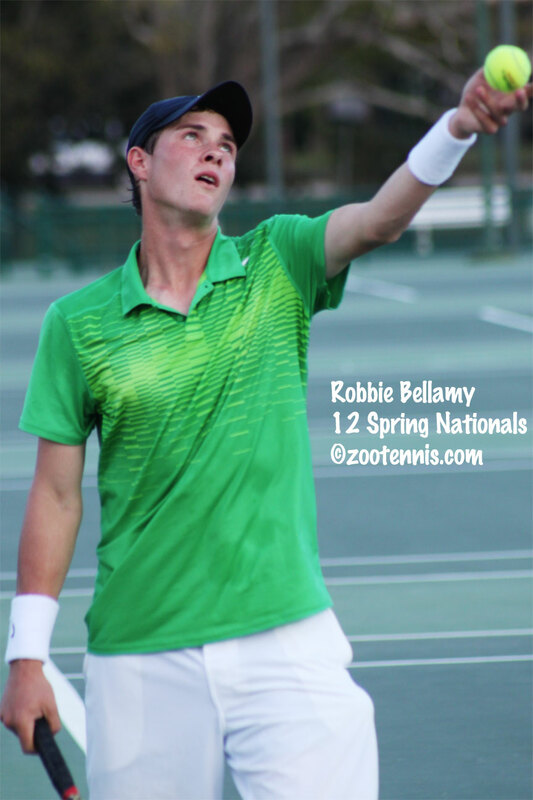 He won the ITF Grade 4 in Plantation Florida early last month. The complete results are available at the TennisLink site. With the completion of the Grass Courts, there are no other ITF tournaments in the United States this summer until the Grade 2 International Hard Courts, which are moving from New Jersey to College Park, Maryland. That tournament, which will include hospitality for the first time in several years, is scheduled for August 20-25. At the $10,000 Bethany Beach Pro Circuit tournament for women, former University of North Carolina All-American Sanaz Marand has reached both the singles and doubles final. The unseeded Marand, who graduated from UNC in 2010, defeated top seed Alexis King in the semifinals today 6-4, 3-6, 6-3 and will play another unseeded player, qualifier Vojislava Lukic of Serbia in Sunday's championship match. The 25-year-old Lukic, once ranked as high as 203 back in 2007, has basically been off the tour from 2009-2011. Marand is playing doubles with Jacqueline Cako of Arizona State, and they are the No. 3 seeds. For the draws, see the Pro Circuit results page at usta.com. Thanks to Parenting Aces for tweeting the link to this study, What makes champions? A review of the relative contribution of genes and training to sporting success posted on the International Tennis Performance Institute's Facebook page, which casts a critical eye on the 10,000 hours theory of accomplishment. That theory, proposed by K. Anders Ericsson, a professor of Florida State, links the acquisition of skill to that particular number of hours of practice. The authors of this study believe genetics are more important than Ericsson gives them credit for and go on to explain why they believe Ericsson is incorrect. It's just another of the many nature vs. nurture discussions that have filled academic journals for as long as there have been such outlets, but it is interesting reading. The sectional qualifying of the US Open national playoffs is rolling along with three more sections deciding their entrants this month. Former UCLA Bruin and current assistant coach at Georgetown Matt Brooklyn won the Mid-Atlantic men's sectional competition, with teaching pro Nika Kukharchuk taking the women's title. University of Detroit coach Pjotrs Necajevs, a finalist in the men's singles, teamed with 14-year-old Sophia Abelson to take the mixed doubles title. For more see the section's website. At the Middle States section, Texas A&M recruit Anna Mamalat won the women's title, with Punch Maleka taking the men's. Ron Mercer and high school-er Stephanie Smith won the mixed doubles. For more, see the section's blog post on the competition. The Southern California section's tournament ends today, and once again, given the area, the turnout was surprisingly low. The men's and women's draws were only 32 and even then had byes, and the mixed draw was only eight teams. Dante Cipulli, a former University of Missouri-Kansas City coach who won the Missouri Valley competition two years ago, beat Jeff Tarango in the men's final today. Mayo Hibi defeated Alyssa Smith in the women's final between two juniors, and USC women's assistant coach West Nott and recent graduate Alison Ramos were in the mixed doubles final against Page Bartelt and Scott Doerner. Two other sections, Eastern and New England, will complete their tournaments Sunday. For an interesting look at the wide variety of players who compete in one of these events, read Ray Krueger's first-hand accounts of his two matches in the Eastern tournament at the New York Times Straight Sets blog. Entries are still being accepted for the Midwest and Southern sectional events at the end of this month. For more information, click on the links for these sections here. This year four sections are not participating: Caribbean, which never did, plus Hawaii-Pacific, Intermountain and Pacific Northwest. This will mean byes in the national tournament in August for the first time. The ITA today announced the Campbell Players of the Year, with NCAA champion Nicole Gibbs and Steve Johnson taking those honors. Gibbs and Mallory Burdette and Chase Buchanan and Blaz Rola were the doubles teams of the year. It isn't always the NCAA champions, but it ended up that way this year. The award is the second straight for Johnson, and he may be able to attend the ceremony this year in Newport, Rhode Island. Last year he couldn't, because he was a practice partner for the US Davis Cup team. For the complete release, see the ITA website. The ITA has also announced three new awards for USTA sectional staffs and volunteers for promoting college tennis. For more information on those awards, see the ITA website. The singles finals are set for the ITF Grade 4 International Grass Courts in Philadelphia. Thirteen-year-old Usue Arconada, the No. 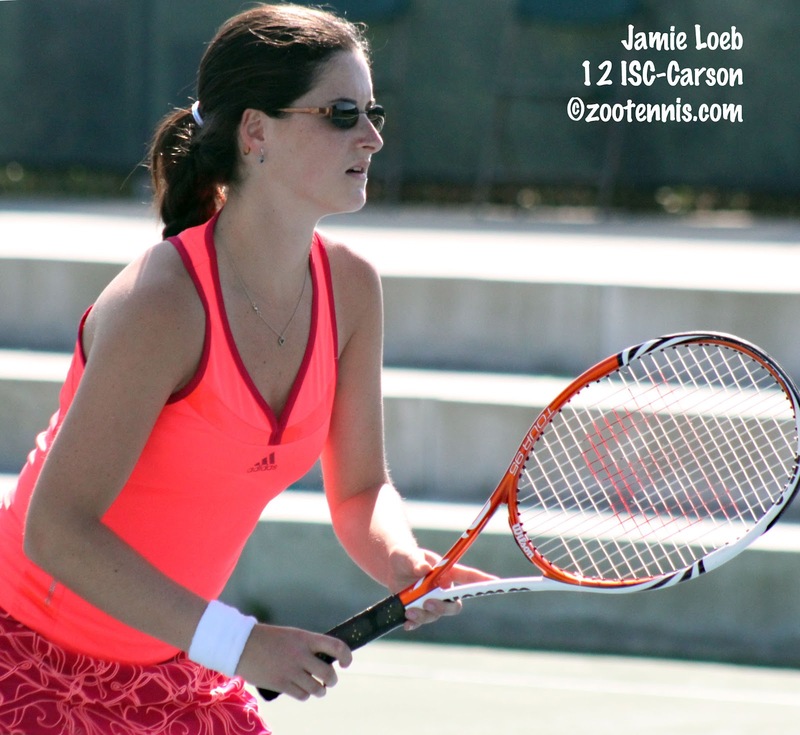 6 seed, will play unseeded Jamie Loeb, 17, in the girls final. Loeb has already secured one title, winning the doubles with Alexandra Morozova 7-6(5), 6-1 over Dasha Ivanova and Rasheeda McAdoo. The boys doubles winners, Henrik Wiersholm and Dan Kerznerman, will play each other for the singles championship Saturday. The 15-year-old Wiersholm is seeded fourth, 16-year-old Kerznerman fifth. In the doubles final, the third-seeded pair beat No. 2 seeds Henry Craig and Josh Hagar 6-3, 6-4. The Florida Closed, which was recently renamed the Bobby Curtis Junior State Championships in honor of the USTA section's legendary junior competition director, wrapped up today and Katerina Stewart and Jaeda Daniel were repeat winners. 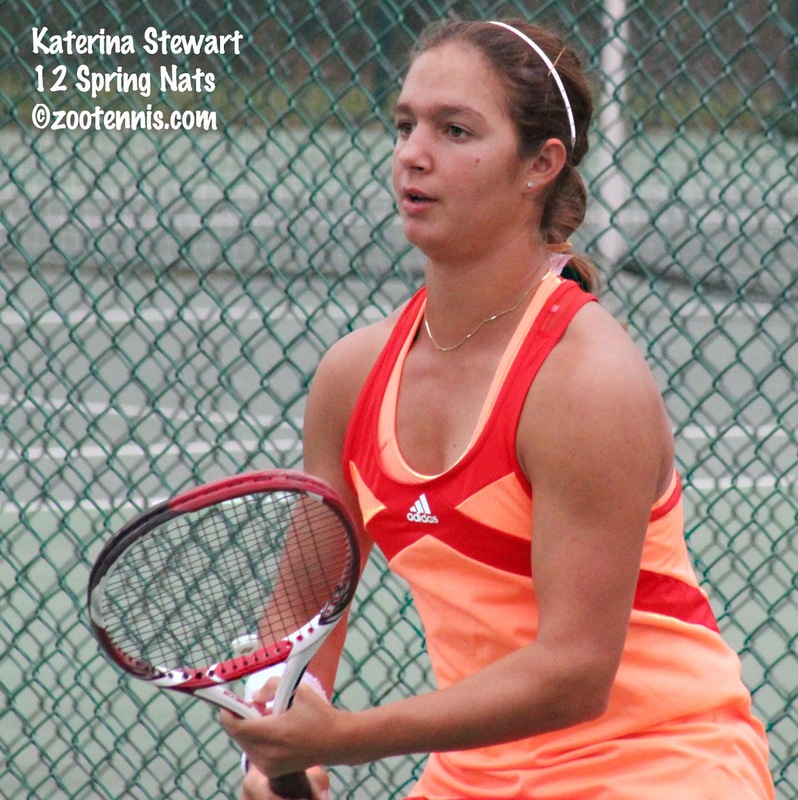 Stewart, who had won the 16s as a 13-year-old last year, took the 18s this year, beating University of Virginia recruit Maci Epstein 6-2, 6-3, and Jaeda Daniel, who had won the 12s last year, took the 14s title this year over Adriana Reami 6-3, 6-3. Dominic Cotrone, who is a rising sophomore at Florida State, won the boys 18s championship. Below are the results of the finals. For extensive coverage, see this article from the Florida section's website. The USTA announced plans today for a substantial renovation of the Billie Jean King National Tennis Center, including a new Louis Armstrong Stadium, a new Grandstand Court, a practice viewing area, and many other changes, but not, unfortunately, any roofed stadiums. For a complete list of the proposed improvements, which will begin next fall and be phased in over the next six to eight years, see this article from usta.com. 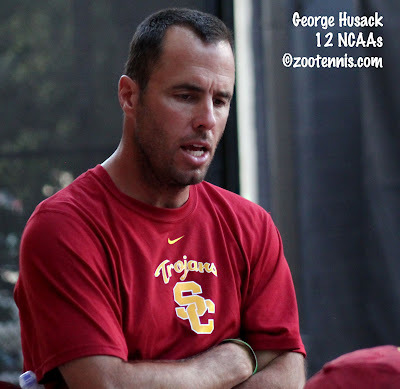 For those of you who are interested in learning more about the Tennis Recruiting Network, the people behind it, its policies and procedures, and most of all, how they come up with their rankings, head over to the Parenting Aces blog. Lisa Stone has done a great job of explaining how it works and provides a timeline for getting the most out of the service they offer. I've been working for Tennis Recruiting for over six years, and yet there were still facts in the article that were news to me. 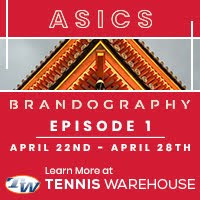 Last month I had the opportunity to sit down with Roland Thornqvist, head coach of the University of Florida women to talk about coaching, recruiting and all things college tennis. These interviews are fascinating for me, and I'm determined to try to do more of them in the future. So far I've done these question and answer sessions with Brian Boland of Virginia, Bryan Shelton of Georgia Tech, Peter Smith of Southern Cal, Manny Diaz of Georgia and now Thornqvist. In every case, I've been struck by the candid and thoughtful responses, and although no two coaches are alike, all share a confidence and awareness that makes these interviews enjoyable and enlightening for me. 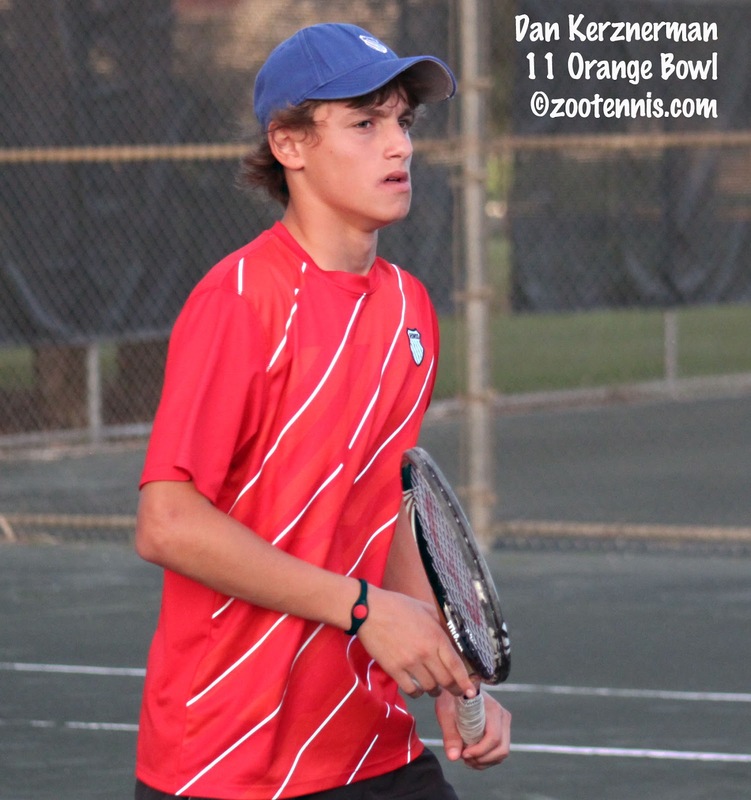 The Thornqvist interview is available now at the Tennis Recruiting Network. It seems as if every day this month there has been big news in the college coaching department, and today was no different, with Southern Cal associate coach George Husack announced as men's head coach at the University of Alabama. Husack, who was with USC three years, takes over for Billy Pate, who left to take the job at Princeton. For more on Husack's previous coaching experience, see the complete release. There are still a few jobs still open, with both Fresno State's men's and women's teams seeking head coaches, along with Georgia Tech women, University of South Florida men, William and Mary women, among others. I've been spending quite a bit of time on college athletic websites recently with all this activity, and I've run across a few transfer announcements of interest. Nelson Vick has left Ohio State and will be joining the University of North Carolina. The University of Michigan has announced the transfer of Vlad Stefan to their school and tennis program. Stefan was a freshman at Maryland last year. With the Maryland men's program slated for elimination, other players with eligibility remaining are likely to transfer, so more such announcements should be coming in the next few months. On the women's side, Tulane announced that Clemson's Klara Vyskocilova will transfer in, with two years of eligibility remaining. And Boise State is adding Sammie Watson, who played one year at the University of Utah. 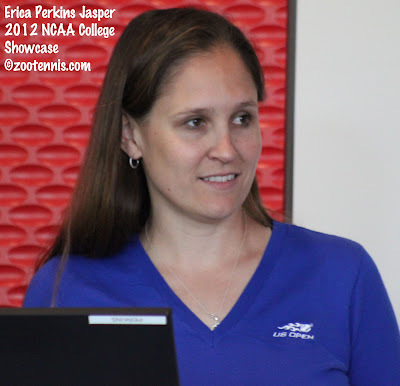 Eric Perkins Jasper, who has spent nearly four years in its Player Development department, is leaving the USTA to take over the women's head coaching position at the University of New Mexico, it was announced today. Jasper, whose title since 2010 was managing director of junior and collegiate competition, was primarily focused on the college side of tennis, and she has served as tournament director at the USTA/ITA Indoor Intercollegiate Championships since it has been played in New York. Formerly the head women's coach at Georgia Southern, an assistant women's coach at William and Mary and the women's head coach at Michigan State prior to joining the USTA, Jasper will take over from Roy Cañada, who was 17-49 in three years as the Lobos head coach. 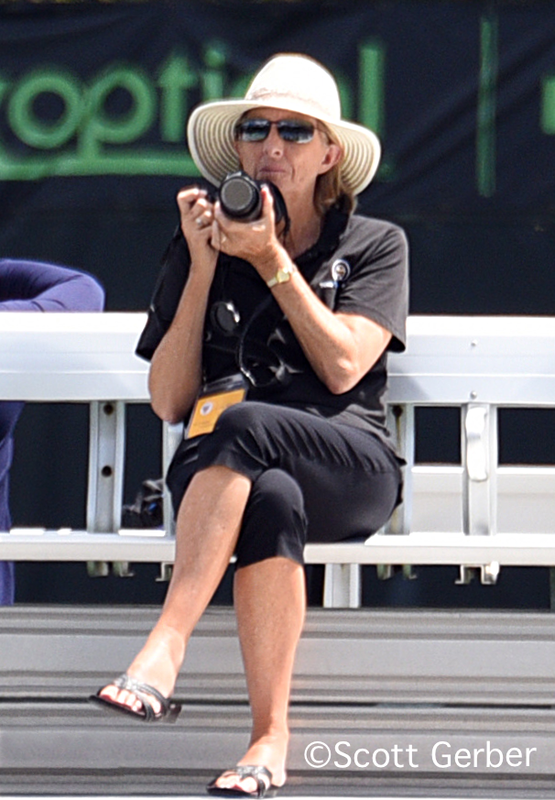 It's difficult to overstate the impact Jasper has had on college tennis since she joined the USTA, with many of the initiatives she helped introduce and implement now major connecting points between the college game and the nation's federation. Those of us who love college tennis are happy she's staying in the game as a coach, but know her formidable communication skills will be missed on the administrative front. The university announcement, with a more thorough bio, is available here. One of the USTA's longtime partnerships with college tennis, the collegiate team, provides coaching and funding for current or recently graduated college players, and today the names of the 2012 team were revealed. In addition to the players named on the men's side, three others will be selected based on their best three results in eight Pro Circuit events this summer. The two names not included that immediately occurred to me are Robin Anderson of UCLA and Alex Domijan of Virginia, but usually omissions are due to personal circumstances and not any oversight by the USTA. The coaches for the women are Megan Bradley-Rose, who recently resigned as head coach at Princeton, and Virginia assistant Troy Porco. The coaches for the men are Bo Hodge, assistant at Oklahoma, and Andres Pedroso, associate head coach at Virginia. Ryan Sachire of Notre Dame will assist Hodge and Pedroso. The complete release can be found at usta.com. In one other college hiring of note, former William and Mary head coach Kevin Epley has been hired as women's head coach at South Carolina. Arlo Elkins, who coached there 29 years, died in April.